Farrar, Straus and Giroux, 9780374536558, 64pp. 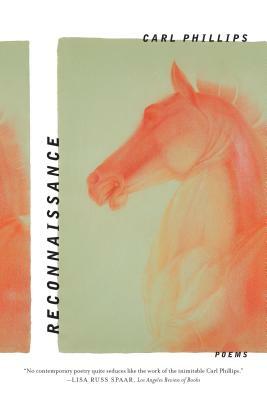 The territory of Reconnaissance is one where morals threaten to become merely “what the light falls through,” “suffering [seems] in fact for nothing,” and maybe “all we do is all we can do.” In the face of this, Carl Phillips, reconsidering and unraveling what we think we know, maps out the contours of a world in revision, where truth lies captured at one moment and at the next goes free, transformed. These are poems of searing beauty, lit by hope and shadowed by it, from a poet whose work “reinstates the possibility of finding meaning in a world that is forever ready to revoke the sources of meaning in our lives” (Jonathan Farmer, Slate). Carl Phillips is the author of several books of poetry, including Silverchest, a finalist for the International Griffin Prize, and Double Shadow, winner of the Los Angeles Times Book Prize. He is also the author of The Art of Daring: Risk, Restlessness, Imagination. Phillips teaches at Washington University in St. Louis. Jeff Clark was born in southern California in 1971. The author of three books of poems--The Little Door Slides Back, Arab Rab, and Sun on 6--he lives in Oakland.